"Our widest reaching project is ‘Shakespeare Week’, a national annual celebration giving primary school children a great first experience of Shakespeare. Shakespeare Week currently reaches 7,500 schools and an estimated one million school children as well as over 200 cultural partners and is a testament to what can be achieved when you think big and work together...."
My first thought was that visitor numbers were low, it was busy on the streets outside but not many people seemed to be visiting the museum. The welcome was excellent with quite a lengthy customer message dealt with in a friendly and easy manner. The Cooper Hewitt is something of a phoenix from the ashes project as it has recently been rebranded, represented, refurbished and reopened. This process took 5 years and 3 directors. When I was first told this I saw it as a weakness that they had had such a high turnover of leaders but in fact the lead curator who I met with said that each director brought what was needed at that point in the development of the project. Although staff tell me that people moan that the new museum is not as good as the old one they have succeeded in totally changing their visitor profile from over 50’s mostly women, to 20 – 50 men and women and a good mix of children too. Their large digital tables which invite exploration were popular with many visitors but seemed to baffle others who seemed unsure of what to make of them. They also distribute digital ‘pens’ to each visitor which can be used to collect exhibition data which interests the visitor and record their personal attempts at design for later retrieval – the pens are used by 90% of visitors but only 30% access their saved data after their visit. The Staff want to work for them because they are seen as a ‘cool’ and ‘with-it’ organisation and the lead curator assures me that ‘we try to make everyone’s voice count both internally and externally’ – this did seem to be reflected by the reality of the visit except for two of the staff upstairs who were moaning to each other about working there! The vast majority however went out of their way to engage the visitors and extend the experience. They hope that their resilience will grow via intergenerational learning and continued innovation and they didn’t seem worried by visitor numbers so perhaps I was just there at a slack moment. I had the feeling they were precarious but had been very brave. 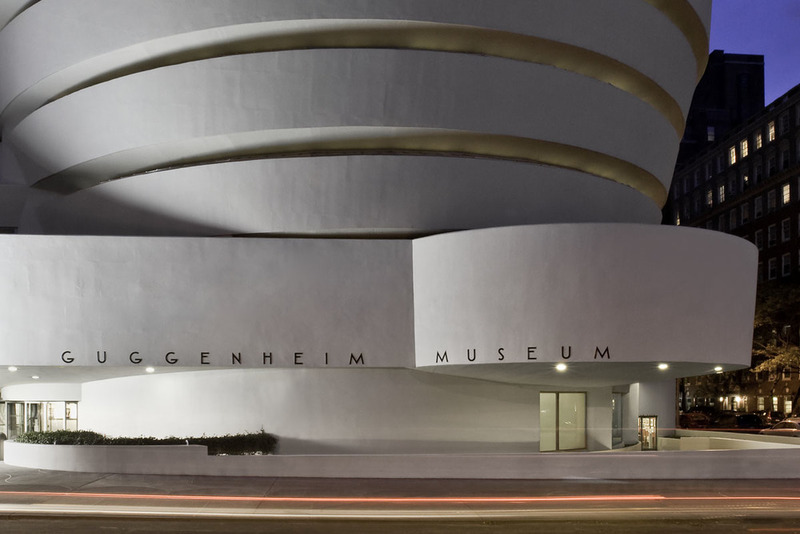 The Guggenheim’s main asset is the building itself – it was clear that visitors were as interested in the structure as in the art work it houses. Their audio tour was very popular however this did mean that there was very little interaction between visitors and staff and between visitors themselves. However, I was told that more interactive experiences do exist and that in fact visitors want to be left alone with the art work not bothered by a ‘digital gimmick’ (this last was possibly a dig at the pens used by the Cooper Hewitt next door!). They seem to rely on their on line projects and outreach programs for the more innovative side of their own work. Apparently they reach a completely separate audience on-line and in the museum. I am told that the staff work for them because they pay a good wage. The staff seemed to be doing a very good job of keeping the art safe I witnessed several instances of staff ‘telling off’ visitors who got too close to the art work. Only one member of staff did a good job of telling me more about the collection. Her input really helped me understand an exhibit and added a personal touch. There were people with badges saying ‘talk to me about art’, however I never saw them talk to anyone and they remained relatively sequestered at the back of the final exhibit. 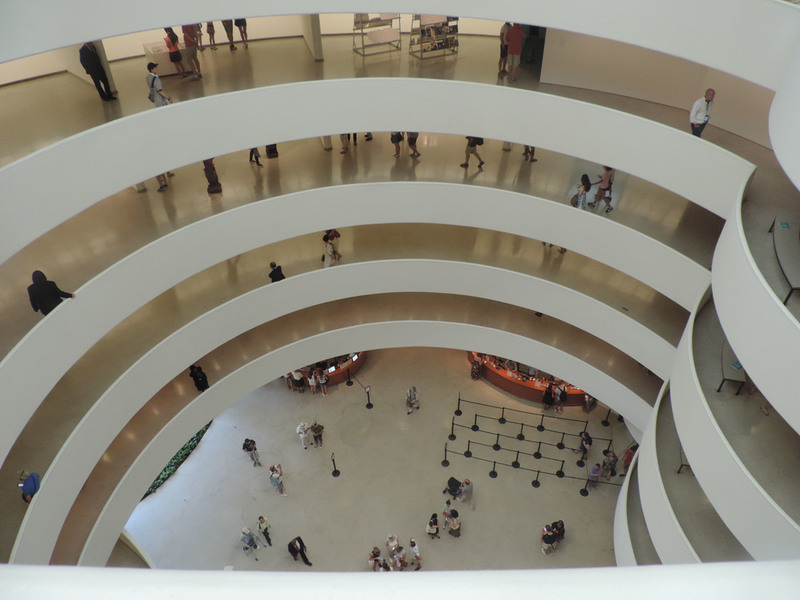 The education staff who I met with were very keen to tell me how innovative their on line and outreach programmes were although in the early days of their outreach they said that they made the mistake of assuming that the Guggenheim name would be all they needed to attract an audience. I am also told ‘we are a goal orientated museum, this can be frustrating if you are a people orientated person’. There is clearly some friction about the international monolith which is the Guggenheim as I was told that some people would not want to work for a soulless franchise with the museum being compared to MacDonald’s. However, the people I met were keen to disprove this myth and to clarify that the organisation was not imperialist and worked hard to create genuinely creative partnerships with artists the world over. My impression was of a divided monolith with very traditional approaches jostling with a more modern outlook. In many ways this was the most inspiring of the places I visited. Although it was not busy when I first arrived at 9am by 12 noon it was very busy. On my way round the exhibition I heard people say ‘I couldn’t come here if I had lost a loved one’ and ‘oh god it’s too much’. The atmosphere is calm and almost hushed – I didn’t hear people talking with one another much although they had come in groups. A certain amount of nervousness still pervaded the area as the museum used body scanners like you see at airports to scan each visitor on entry. 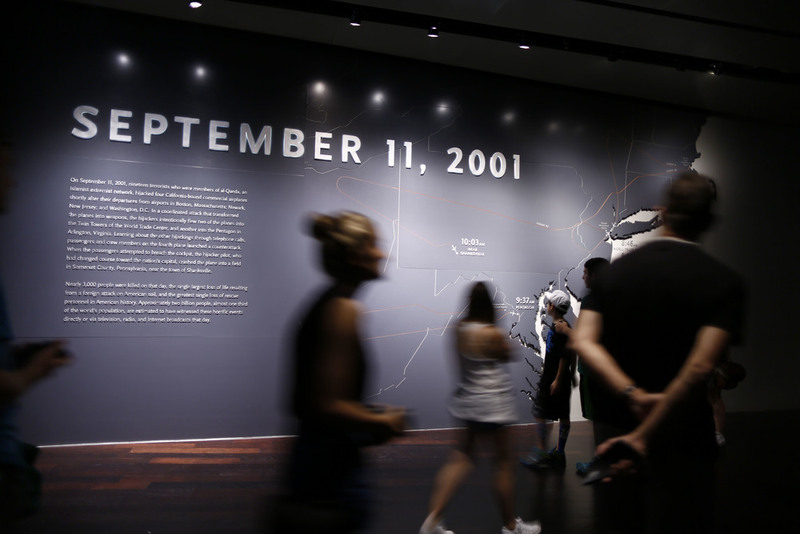 My host explained that they had designed it for those who had a personal connection to the tragedy and had not anticipated it being an international tourist attraction. The exhibition itself is quite hard hitting and people are advised that it may be unsuitable for children under 11 – however everyone I saw decided to take their children in anyway. The most disturbing elements – images of people who jumped from the building - are in a secluded corner. We discussed how the exhibition would develop as time separated us from the tragedy and whether it would have to become more ‘shocking’. I was told that they hoped that long term it would be able to comment on itself, looking back at the current interpretation. I was told “I do not feel we have done enough to address the fear of hatred amongst the Muslim community” although there is also the sense that they do not wish to court difficult questions. The transition from a theoretical museum in the planning stage and the open museum has not been entirely smooth and in some cases it has been hard to recognise that what looks good in theory may not work in practice. They invest a lot in staff training and people work for them because they are new and high profile. They remain a flash point and protestors said things like ‘don’t put a gift shop on my sister’s grave’. They do have a gift shop but it’s off the main visitor route so the commercial element is not very obvious. They are aiming to make the story they tell more one of resilience and hope rather than letting the museum become ‘the house of depression’. I felt they were resilient so long as their ability to adapt and change was not stifled.